The GearWrench cushion grip flex ratchets feature a dual material cushioned grip to provide extra grip and comfort. These GearWrench cushion grip flex ratchets are made with an enclosed head design, for extreme resistance to dirt infiltration. 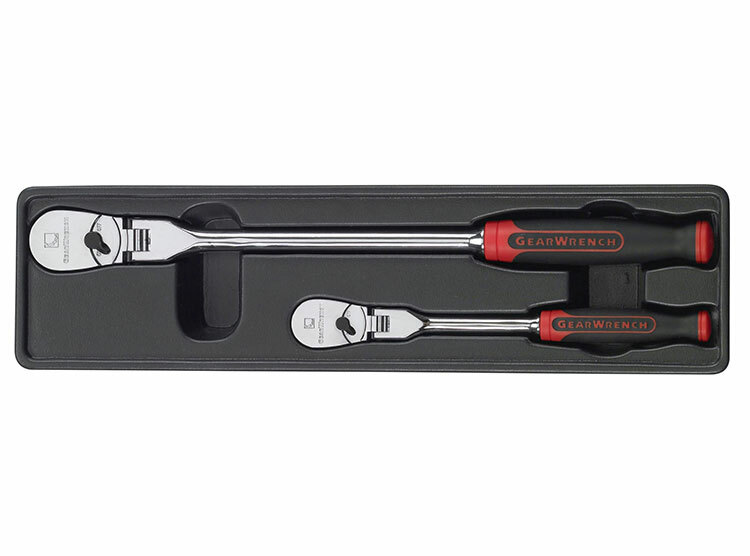 The GearWrench comfort grip flex handle ratchet set also features a 6-position flex head for an adjustable access angle. These ratchets meet or exceed ASME B107.10. GearWrench 1/4'', 3/8'' and 1/2'' drive full polish teardrop ratchet 2 piece set. The 81204F GearWrench 1/4'' and 3/8'' Drive Cushion Grip Flex Teardrop Ratchet 2 Piece Set is one of thousands of quality tooling products available from MRO Tools. 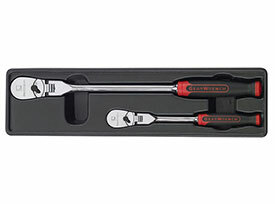 Please browse GearWrench Multidrive Ratchet Sets for tools similar to the 81204F GearWrench 1/4'' and 3/8'' Drive Cushion Grip Flex Teardrop Ratchet 2 Piece Set. 81204F GearWrench 1/4'' and 3/8'' Drive Cushion Grip Flex Teardrop Ratchet 2 Piece Set description summary: GearWrench 1/4'' and 3/8'' drive cushion grip flex teardrop ratchet 2 piece set. Quantity discounts may be available for the 81204F GearWrench 1/4'' and 3/8'' Drive Cushion Grip Flex Teardrop Ratchet 2 Piece Set. Please contact MRO Tools for details.